My 26-year-old daughter, Valerie, tagged her first whitetail last season, a four-point buck. She dropped it with a shotgun slug. This year she's determined to kill a whitetail with a bow. Valerie got her first bow, a Bear Siren RTH (Ready To Hunt), a few months ago. The compound came complete with a Trophy Ridge quiver, 4-pin sight, Whisker Biscuit, stabilizer, sling and an installed peep sight and nock loop. All Valerie needed was a matching set of arrows and a trigger release. We could have bought what she needed and done the final tweaking ourselves. 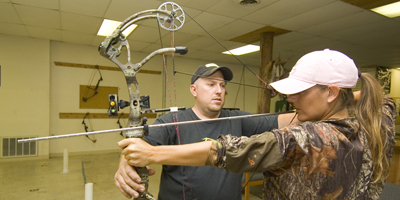 Many novice bowhunters do this, as do experienced hunters when they rig a bow for a spouse or a youngster. I suspected that this approach might get Valerie off on the wrong foot. For one thing, I'm a stickbow shooter. And, even if I did shoot a compound bow, I knew I couldn't set up Valerie's bow as well as an experienced bow technician. I happen to have a capable bow techie 45 minutes home. His name is Shane Hyme and he owns and operates Fairfield Outdoors in Lancaster, Ohio. Valerie and I made an appointment with Hyme to have him set up her Bear Siren. I kept my mouth shut as Hyme measured Val's draw length, recommended arrows and broadheads and let her try on several releases. Then he adjusted the bow's draw length, weight, the peep and the sight specifically for Valerie's frame. Hyme did this fast and efficiently, while explaining the steps he was taking so she could learn the bow's intricacies. At the shop's 20-yard indoor archery range, Hyme gave Valerie sound shooting advice that had her hitting the mark in short order. This eliminated bad form she likely would have developed on her own (or with my misguided help). Valerie was full of enthusiasm and confidence when we left Fairfield Outdoors. We tweaked her sight during backyard practice sessions. Then she began shooting from a tree stand. At this point, all systems are go. She'll soon be in a tree with her Siren for the first time. All we need now is a little luck.